The CorkSport Mazdaspeed3 Adjustable Short Shifter designed as a direct OEM replacement, maintains OEM fitment offering you to independently adjust shift throw distance and shift knob height. The CorkSport Adjustable Short Shifter is designed using CAD technology, a lightweight and stronger anodized shifter body and machined from 6061-T6 aluminum. 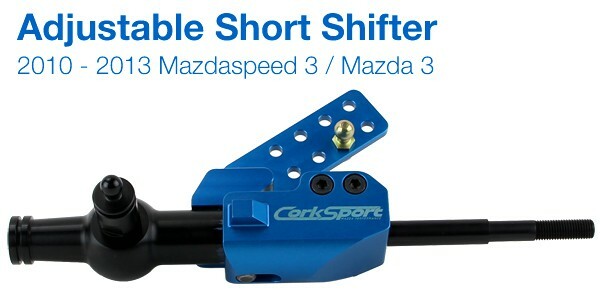 CorkSport's CAD design will allow you to precisely adjust your shift throw to your driving style. Designed to let you drive your Mazdaspeed 3 the way you want to. The CorkSport engineers created a simple way for you to adjust the shift knob height a range of 4 inches. With a height of 12" and a low of 8"
Adjust your shift throw up to 35% shorter than OEM for faster and efficient shifting. Designed to easily replace the OEM plastic design with a durable machined aluminum body to handle a variety of shifting styles from the casual to aggressive driver. Designed: Specifically for the 2010-2013 Mazdaspeed 3. 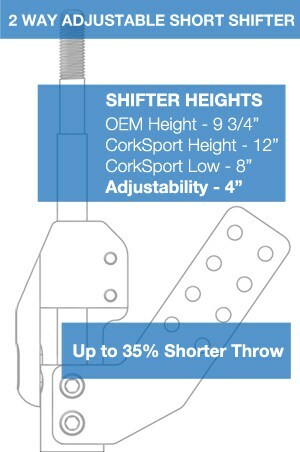 Shift Throw: Up to a 35% shorter shift throw over OEM. Shift Knob Height: Up to 4 inches of shift knob height range with high of 12" and a low of 8"
Versatile: Compatible with the OEM system and easy to use the OEM or aftermarket shift knob options. Ease of Use: Easy to install, you will be ready to short shift within an hour. CorkSport Service and Support: Receive a 2 year warranty, full color installation instructions, all of the needed installation hardware, and knowledgeable telephone support. I only gave this a 4 star rating instead of a 5 start rating because the install isn't all that easy its alot of delicate plastic parts that are hard to get out without coming close to destroying them. Very intricate tabs to get the original gear shift out of the plastic housing that it sits in and the 3 tabs are super hard to undo and keep undone while removing the stock shifter. You will have to exercise patience. 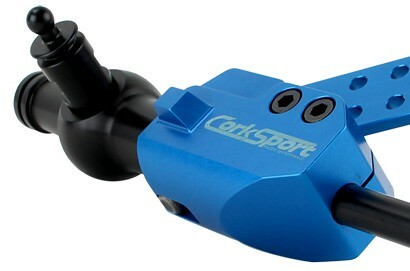 I would highly recommend the 4 Corksport Base Bushings as well since you will already have the base unit unbolted. Once you have the new bushings in and the new short shifter in it rockets right into a 5 star rating. As one of the previous reviews state its PURE Magic, makes the speed3 faster cause you can shift so fast with this thing and it makes for very very nice solid shift notching no play whatsoever. Makes the speed3 super fun to drive and adds a nice high quality shifting experience to the speed3. Definitely a dramatic improvement over the OEM shifter, especially when considering the price. Corksport has done an amazing job with this mod and the quality you'd expect is very much apparent. Installation was straight forward, adjustments to the shifter can be done quickly and cater to any driver's preference. Excellent job Corksport, now how about a performance steering wheel for us Genpu owners. My car now has its 9th part from corksport. The products still continue to amaze me with quality. The only thing that stopped me from giving this 5 stars was the instructions. There were a few parts left out that are needed to be added for the 2013 mazdaspeed 3. Also, when removing the stock shifter from the shifter cup, you need to push in the tab on the outside and then pull in the other two tabs. instructions say to push all 3. This does not allow the shifter to come loose. All in all, very happy again. will continue to buy more! The lroblem I have with the product is the instructions that come with. I seem to keep having these issues. The instructions given do not match all gen 2 mazdaspeed 3s. I have a 2013 and every single part I have installed with the exception of my RMM has had something different that I have had to do to make these parts work. It's very frustrating. I'm not a certified mechanic but It shouldn't be this difficult. The instructions say to press in all 3 tabs and pull up simultaneously to remove the stock shifter. How is it possible to press in 3 tabs AND pull up at the same time? This is not as easy as stated. And the tabs do not just press in like they should. Not on my 2013. Would like some advice on how to get this fixed. Because all this time I put I is now wasted. I bought the short shifter last week and just got around to install it, but this thing is amazing. When I shift it is smooth and accurate. I love the height of it as well. I installed it under 30 min so I was on the road and ready to go. I definitely recommend this product. Great Job Corksport!!! This is a must have upgrade for your car. I had the short shift plate, and ran into an issue with Ball and nut coming loose. The install was pretty straight forward with the supplied instructions. And really enjoy the short shifts again. Sloppiness is gone when I shift, and feel more comfortable shifting. So I purchased this short shifter and only heard good things! But have not installed yet because I'm scared I'll break the retainer clip.. I know it says use a pick tool and flat head but still feel as if I'll break it.. anyone have any other suggestions? Does this replace the short shift kit? Do I remove any short shift kit i have under the hood before installing this? I purchased this short shifter shortly after their release in April 2014. And all I have to say is- finally! Finally there is a reasonable alternative to the $450+ full short shift replacements. I installed this mid/late-April along with the CS shifter base bushings after receiving my order (Corksport actually called me to inform me my order would be a little late. An actual phone call, go figure. +10 for customer service) and installed the CS base bushings, CS short shifter, and plopped my Razo RA68A (fantastic knob btw) on top. I ended up having the linkage attached to the shifter at the 2nd to shortest setting, and the knob height maybe 1 1/2 - 2cm above the lowest setting. I gotta say, holy hell. The shifter now feels like what the stock shifter SHOULD have felt like. MUCH shorter and more pleasant to use in both daily and high-throttle circumstances. A long time ago I drove my buddy's Speed MX-5 and was impressed with the shifter, and this model is not too far behind. Slamming through gears is very quick and almost faster than the synchros (or maybe my left foot?) can handle. Do note it really doesn't affect your 2-3 and 4-5 shifts, but the 1-2 and 3-4 shifts are magic. The only con that I can think of is really that it doesn't have the bend of the original shifter, which leaves it a bit off center and about a cm away from the ebrake during 6th, but I really don't find that to be an issue. I have seen some more OCD forum members complain about that, however about a week or two of use and it hasn't really bothered me. It's been 8 months now and I have no complaints. Would definitely recommend. Do the shift base bushings and a nice heavy knob at the same time and you won't regret it. Roy what did you make to take out that brittle clip, I could not get mine out without breaking it? Havent bought this yet.... But if i already have the short shift plate will this still make any difference? Will i have ultra short shifts? Can I use this with your short shift plate and brushings? Will this ever be made for the 5 speed 2nd gen mz3?? What are the chances that this will fit my MZ6 or that you guys make a short shifter for the MZ6? CorkSport Reply:Check out the FAQ Tab for this product to get an answer. Is there any reason not to have this AND the short-shift plate together? I'm glad I waited for this! This thing is just beautiful. Install was about 30-40 mins. Only problem I had was adjustment otherwise install would have been about 30 mins. I made a special tool to take out that brittle self locking plastic cap. Awesome and a MUST HAVE product. Shifting is amazing, I didn't really know how long of a throw I had until the install. Exceptional job guys! What about in combination with the short shift plate? 75% reduced throw if both set to max reduction, hmm? I like the idea, if not in conjunction with the plate then what different effect is there vs the plate? The plate reduces the throw to 2, 4, 6. Where is the reduction most evident on this? How much lower vs stock height does this adjust to? Will there be a 5 speed version of this in the near future? If you need someone to test it, I don't live close but I am more than willing to help out. Put it in last night!! Although I had a problem with getting the Shift Cables off of the base and getting the Shifter Cup out of the base installation was a breeze! Shifting this morning on my way to work was amazing! so smooth! Very Precise! Short Throws! Highly Recommended!!! Thanks Corksport! Is there a skyactiv shirt shifter available? Ordered the shifter Thursday, received and installed today (Tuesday), and so far I love it. The throws are a lot shorter (customizable) than even my short shift plate I had installed, and the ability to adjust the height is also a great feature as well. The shifts felt more precise and overall really smooth. Install wasn't bad at all, an hour give or take a few minutes sounds about right (you're probably going to spend a few extra minutes adjusting the shifter's height and throw to your liking). Really pleased with the product, it's definitely a must-have, even for every day non-spirited driving. Thanks again for an A+ product. Will this work well with your shifter plate already installed? I was the beta tester for this shifter. My overall impression of this is that its probably one of the best mods we can have, for the price. This removed all of the sloppiness the oem shifter has. Throws are definitely more precise, and on point. Having driven speeds, both gen1 and gen2, that had the TWM full replacements, there is a difference, not only price wise, but the fact that i was able to adjust the height, and throw, saved my pinky from being smashed into the ashtray lid. Installation is very easy, the instructions are spot on. I had it installed in under 45 mins, and 15 mins to adjust the cables. Shifter has handled all the beatings I've thrown at it on the street, and i look forward to using this next week at the Epic Meet at the track. 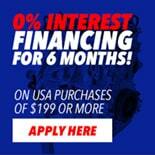 Does it work for a 2012 mazda 3 5 speed?? Will this fit on a 5-speed mazda3 2010? Silver spring from OEM shifter won't fit corksport short shifter after so much usage. Can I buy one of these from you guys? Are you referring to the centering spring that is placed on the side of the assembly? It should fit. Give us a call if you haven't already figured this out. Sorry for the delayed response. Will gen 2 fit on gen 1? i just got a used one of this shifter part#axl-6-963-10 will this work on 2013 mazdaspeed3? If the bar code ends in a -10 it will not. Email sales@corksport.com if you do not have the original box and we can ID which version and fitment it is. Will this work with an aftermarket ACT clutch? The clutch does not make a difference. Yes it will work.